It is also known as calcium sulfate plaster and obtained by heating gypsum. When water is added to the plaster of paris it forms a plastic mass, which sets quickly. Plaster of paris adheres well to gypsum, wood, metal lath, masonry or other plastering surfaces. The setting time of the plaster of Paris can be controlled by the addition of certain salts. It is mostly used in combination with ordinary lime for making good small defects in plastered surfaces. Since gypsum is slightly soluble in water, plaster of paris is not used for external works. This is hardest and densest form of gypsum plaster. It is obtained by a calcining selected form of gypsum. It is pure white in color and takes a high glass-like polish. It is used for highly decorative plastering work and ornamental work. It is used alone for an extra hard finish or it is mixed with lime putty for a medium hard finish. This is essentially made from barium sulfate and is applied in the form of final coat to serve as a protection around X-ray rooms. This is gypsum mixture, which is employed as a final coat to serve the purpose of a sound-repellent finish. The minute passages in the form of tiny openings in the plaster coat, absorb sound. The plaster is usually applied in two coats, each 6 mm in thickness. The surface must be finished uniformly in a manner that promotes porosity. Wooden floats preferred to a steel trowel in finishing. 8. 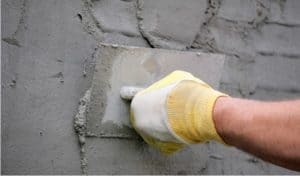 Snowcrete and colorcrete cement. Also Read – How To Select Materials For DPC.